On your trip to Israel, even if your home base is Jerusalem, chances are you’ll want to stretch your wings a little and visit the rest of the country. And unless you’re renting a car, you’ll probably end up at the Central Bus Station on Yaffo Road. It’s a busy and sometimes confusing complex, but once you learn a few things you’ll be navigating it like an expert. Getting to the Central Bus Station, or CBS, is fairly simple. Every cab driver knows where it is, the light rail has a stop right outside, it’s a 20 minute walk from the center of town and a large number of intercity bus lines stop there. Specifically, the 1, 3, 6, 7, 8, 8, 9, 14, 15, 18, 21, 25, 31, 32, 39, 41, 45, 54, 60, 63, 66, 67, 68, 69, 70, 74, 75 all stop near the bus station – some directly outside and some on Shazar Street, outside Binyanei Hauma. If you get off there, depending on which side of the street you’re on, you will have to either cross the light rail to enter the building or go through an underground passage before crossing the tracks. The entrance to the underground passage is located to the right of a small kiosk. At pretty much any time of day, you can follow large crowds of people making the same trek. Like anywhere in Jerusalem, there is a heightened level of security to enter the building. Though the police briefly ended the security checks at the door earlier this year, they have since been reinstated. There are two entrances to the bus station on Yaffo Road – the main entrance which has a row of metal detectors and x-ray machines, and a smaller entrance with two metal detectors further to the right if you are facing the building. If you are carrying a large bag – even a well-stuffed backpack – you must enter through the main entrance, since the other one does not have an x-ray machine and the security guards won’t let you through. For this reason, the smaller entrance also tends to have a shorter line. At peak travel times and during the holidays, the wait to enter the building can be significant, 5-10 minutes at times, and that should be factored into your planning to catch a bus. There can also be a fair amount of pushing and shoving but try to stand your ground. There is also an entrance in the back of the CBS, which enters into the area where passengers are dropped off from intracity buses. Once you’re inside, there’s plenty to do, assuming you’re not rushing to catch your bus. There are three main levels to the CBS: the first floor, which houses a number of retail stores, the second floor, where the food court and other stores are located, and the third floor, where all the bus platforms – and a few food stands – are found. Stores on the first floor include Fox, a bookstore, a wide variety of clothing and shoe stores and Superpharm, a drugstore. 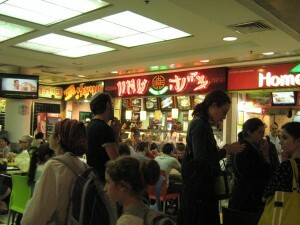 There is also a kosher branch of the Aroma coffee store. 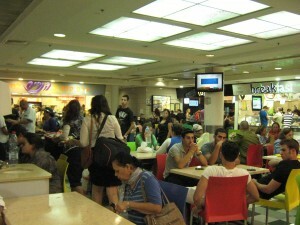 The second floor includes a dollar store, kitchenwares shop, bookstore, candy store, electronics outlet and others – plus the food court. The bathrooms inside the bus station – which cost 1 shekel to use – are located in the basement level, and you must take the elevator to get there. The third floor is home to all the bus platforms, ticket sales, information and a synagogue (with no women’s section), plus a bookstore, toystore and luggage store. Holy Bagel, Pinati (a Middle eastern comfort food restaurant), Pizza Home, Burgers Bar, McDonald’s, Pita Place, China-Town, Breakfast Bar, Crepe Bar (with ice cream), and the Taboon bakery. All the options in the food court are kosher. 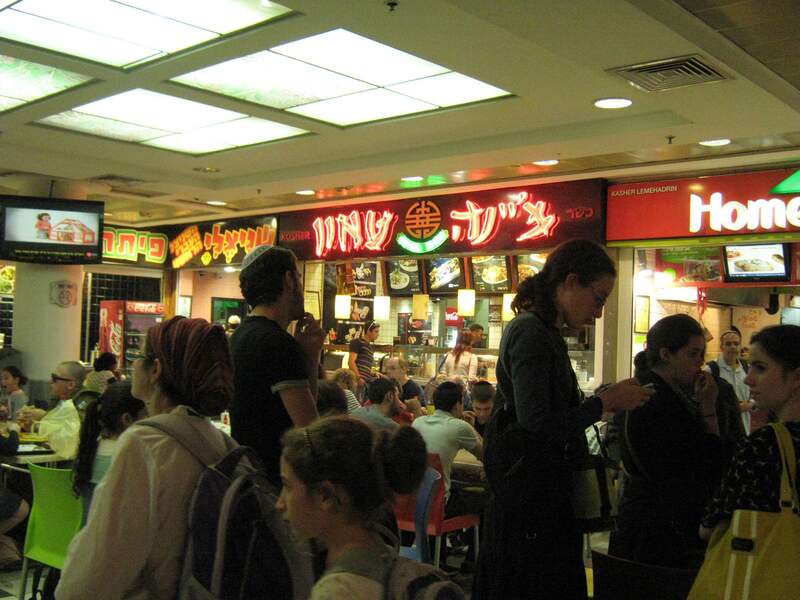 There is also a Ne’eman bakery on the first floor, a Ne’eman cafe on the second floor separate from the food court and a Ne’eman express near the smaller Yaffo entrance. All the Ne'eman locations are kosher and mehadrin dairy. 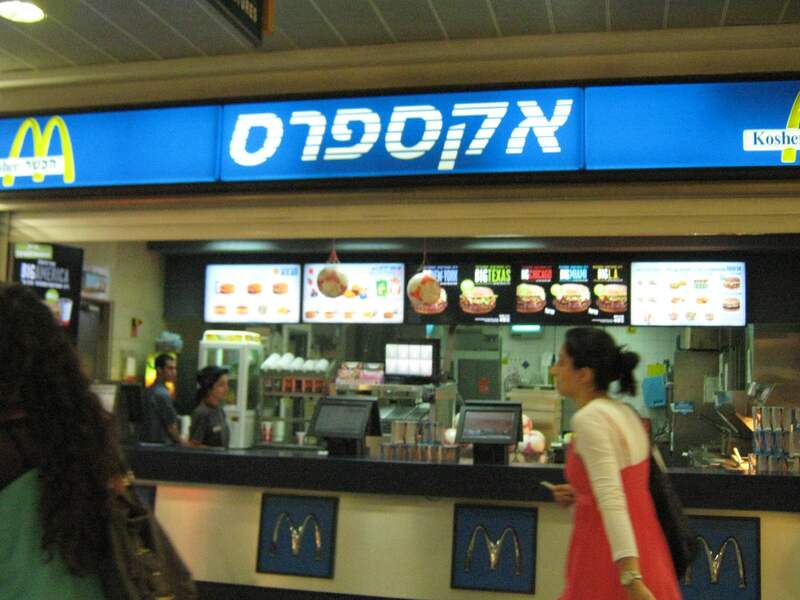 The third floor also includes an Internet cafe and a few smaller food kiosks – which should be checked for kashrut certificates before purchasing. There is an extensive candy story on the second floor with both packaged and loose candies and chocolates – as well as standard Israeli snack fare – check every package for a hechsher and ask about the products in bins. If you’re just here for the buses, then skip right to the third floor. There all the platforms for intracity buses are housed – and you can go anywhere from Tel Aviv to Efrat, Eilat, Haifa and Beersheva. Most of the bus lines are run by Egged, but there are also routes serviced by Superbus and Dan. When you get off the escalator, go to the left or right and find screens that list the locations and platform numbers. The board cycles through the list and doesn’t move that fast, so if you know you’ll be in a rush you might want to check the platform number on line beforehand. With the exception of trips to Eilat, you can buy your ticket from the driver with cash when you board. The buses all have compartments underneath to store bulky items, but if you’re not getting off at the very last stop you should warn the driver when you depart so you don’t end up on the sidewalk watching your suitcase be driven away.